Thank you for your interest in Yeager Airport. At times, the Central West Virginia Regional Airport Authority will publish public notices and other public documents. The documents will be displayed here for viewing by the general public. Please contact the individual listed on each document for additional information. Manufactured by Erect-a-Tube – Model Number N60-45.Constructed in 2012. Aircraft storage units are 45’ width and 39’ depth.Wing depth is 21’-0” and Tail width is 22’-6”. Aircraft storage units include 44’-6” by 14’ electric bi-fold doors. Prospective bidders are urged to visit the Airport to inspect the building. Bids will be received until 3:00 PM on Tuesday, May 14, 2019. The Authority will open the bids and read them publicly at 3:00 pm on that same day. The Authority will award the bid to the highest bidder at their regular meeting at 12:00 noon on Wednesday, May 22, 2019. A Notice of Award will be provided to the high bidder within 10 working days of the bid opening. Questions regarding this Request should be submitted via e-mail to kevin@yeagerairport.com. All questions must be received by Friday, May 10, 2019 at 4:00 pm. 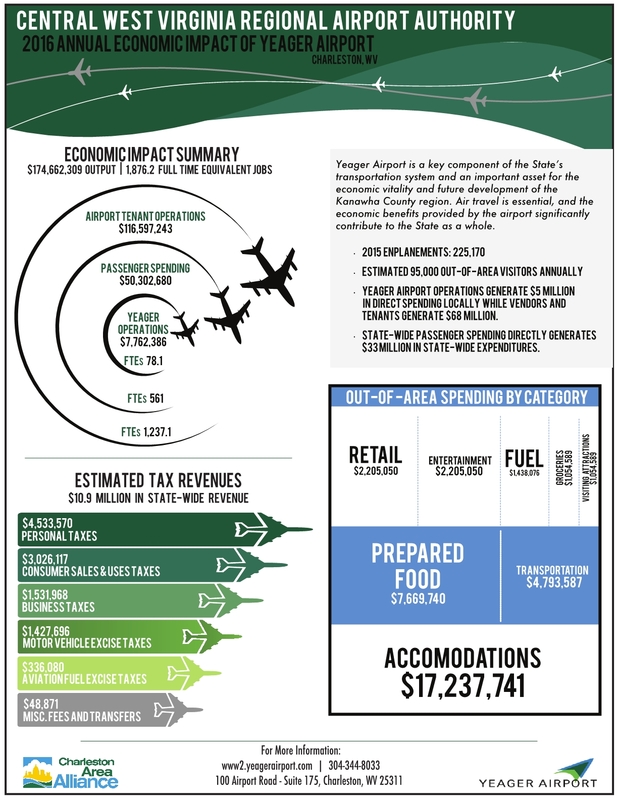 The Central West Virginia Regional Airport Authority is soliciting proposals from all interested and qualified parties to operate, manage, and maintain the non-exclusive Food, Beverage, Retail and Vending Concession at Yeager Airport (CRW), located in Charleston, West Virginia. The operation and management by the successful Proposer(s) shall include providing quality products and strong customer service and shall be competently managed by a local manager. A pre-proposal meeting is scheduled for 9:00 am local time on January 15, 2019 in the Conference Room located on the second floor of the Airport terminal building. Attendance is strongly encouraged. Sealed proposals are due to the Authority addressed to “Central West Virginia Regional Airport Authority – Yeager Airport” no later than March 8, 2019 at 11:00 am local time. The Central West Virginia Regional Airport Authority (CWVRAA) seeks sealed Bids for the Yeager Airport Rental Car Wash Equipment Replacement. Bids will be received by the Central Regional Airport Authority, 100 Airport Road, Suite 175, Kanawha County, West Virginia, until 2:00 p.m., E.S.T., on Thursday, October 18th, 2018 for furnishing labor and materials and per­forming all Work set forth in the Contract Documents prepared by The Thrasher Group, Inc.
A major aspect of the project will be a rehabilitation of Runway 5/23. The Central West Virginia Regional Airport Authority (Yeager Airport) will receive sealed Bids for the construction of a solar photovoltaic (PV) power system, including solar energy arrays installed on a steel canopy over the existing long term parking garage; associated appurtenances and connections to the parking garage power system and the utility; and other incidentals necessary to complete a functioning project (Project). Sealed Bids will be received until 2:00 PM L.P.T., on Thursday, June 28th, 2018 at the Director’s Office, Yeager Airport, 100 Airport Road, Suite 175, Charleston, WV 25311. The Central West Virginia Regional Airport Authority (CWVRAA) will receive sealed bids in the Airport Director’s Office located at 100 Airport Road, Charleston, WV 25311 until 2:00 PM, Friday, June 29th, 2018, for multiple pavement rehabilitation projects. Sealed Bids for the Central West Virginia Regional Airport Authority Security Enhancements will be received by the Central West Virginia Regional Airport Authority, located at 100 Airport Road, Suite 175, Charleston, Kanawha County, West Virginia, until 2:00 p.m., L.P.T., on Monday July 9th, 2018, for furnishing labor and materials and per­forming all Work set forth in the Contract Documents prepared by The Thrasher Group, Inc. Sealed Bids for the Central West Virginia Regional Airport Authority Contract #1 – Acquisition of Snow Broom with Air Blast will be received by the Central West Virginia Regional Airport Authority, located at 100 Airport Road, Suite 175, Charleston, Kanawha County, West Virginia, until 2:00 p.m., L.P.T., on Monday July 9th 2018, for furnishing labor and materials and per­forming all Work set forth in the Contract Documents prepared by The Thrasher Group, Inc. Sealed Bids for the Central West Virginia Regional Airport Authority Contract #3 – Acquisition of Police Vehicle will be received by the Central West Virginia Regional Airport Authority, located at 100 Airport Road, Suite 175, Charleston, Kanawha County, West Virginia, until 2:00 p.m., L.P.T., on Monday July 9th, 2018, for furnishing labor and materials and per­forming all Work set forth in the Contract Documents prepared by The Thrasher Group, Inc.